511 Tactical RUSH Delivery XRAY Bag (56178) FREE SHIPPING! 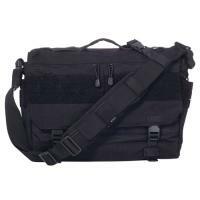 5.11's RUSH Delivery X-Ray Bag is a versatile carryall--suitable for business, travel or tactical duties. Constructed from rugged, water-resistant 1050D nylon with Duraflex™ and YKK® hardware, the X-Ray was made to withstand the toughest climates and harshest working conditions. The interior features a padded laptop sleeve to protect valuable electronics, a quick-draw pocket for concealed firearms and instant access to an admin panel that conveniently stores keys or other small items. The wrap-around web platform is compatible with MOLLE, SlickStick and Back-Up Belt Systems to provide the ultimate in user customization. Two comfortable carry options, the cross-body strap or detachable luggage handheld holder, ensures 5.11's X-Ray is a choice bag for tactical professionals on the go. Dimensions (H x L x D): 12" x 20" x 6.5"
©2002-2019 CopsPlus.com: 511 Tactical RUSH Delivery XRAY Bag (56178) FREE SHIPPING!